Jen and Nate got married. The next week, they started their first-ever farm share. This is the nerdy story of their marriage and their vegetables. With a focus mostly on the vegetables. Yesterday I picked up the second to last farm share of the season. The area I picked up at was still mostly out of power. The pickup location was running on a generator and the street was littered with out of town utility workers who, two weeks later, were still working around the clock to restore power to the area. This is a comparatively wealthy part of a very wealthy town so I'm guessing if they hadn't restored power yet things were probably pretty serious. 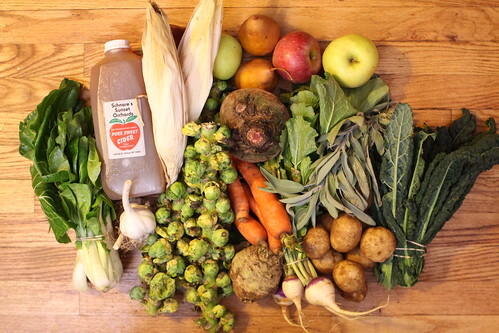 This week we got two pounds of beets (which ended up being one giant beet), carrots, two Brussels sprouts stalks, a bunch of kale, garlic, sage, boc choi, celeriac, turnips, pop corn cobs, Winesap Stamen Apples, Golden Delicious Apples, Bosc Pears, and a jug of apple cider. The doctor said to monitor the babies for interest in solid food. She said once they showed interest we could start feeding them solids. We started putting them onto the dinner table in their Bumbos while we eat dinner. At this point they have shown less interest in solid food than just about anything else we've ever exposed them to. Martin, however, did enjoy sucking on my finger after I ate short ribs the other night. He enjoyed it so much that he has since tried sucking on me and Jen's fingers a few times only to give us a look of skepticism and disappointment when he has discovered a distinct lack of short rib flavor. 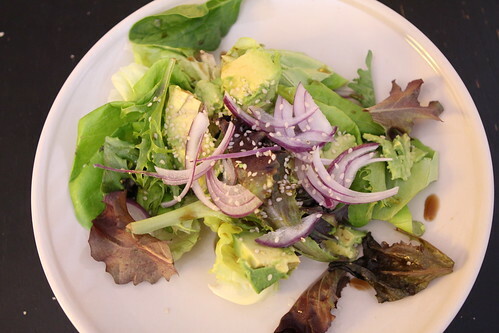 For salad tonight I made this salad with leftover Boston Bibb lettuce, avocado, red onion, sesame oil, lime juice, and soy sauce. After getting the Wombats home from daycare and dealing with their post-daycare freak out (well, mostly Martin's) there isn't a lot of time to cook dinner these days. I have started a daily routine whereby I put them into a dimly lit room and play soothing music. So while they freak out I jump into the kitchen, hastily chop up some vegetables, and then throw it in a pot to simmer while I tend to them. Tonight I chopped up some onion, carrot, ginger, turnip, bok choy, and ground pork and threw them unceremoniously into a pan with some sesame oil, soy sauce, and the remainder of the short rib braising liquid from the other night. 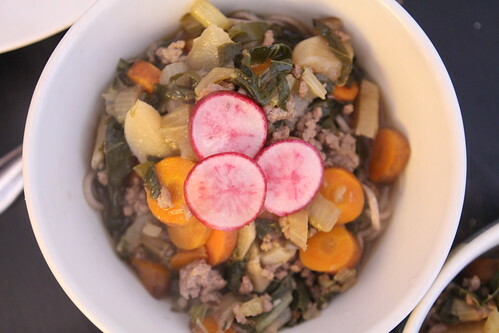 I cooked up some soba noodles which I served the dish over with some sliced radishes and freshly squeezed lime juice. 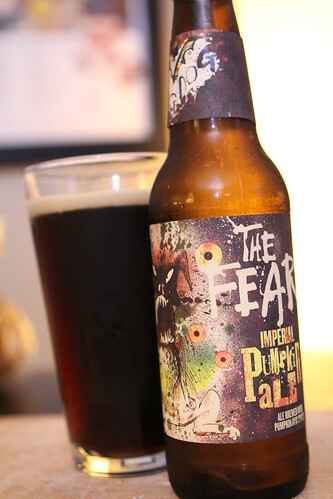 For beer we ended our 2012 pumpkin beer season with this beer called The Fear Imperial Pumpkin Ale from Flying Dog Brewery. This was the most unique of the batch for sure. It was dark and had a coffee and chocolate bitterness to it, something unlike anything I've experienced in a pumpkin beer before. I hesitate to list it with the rest of the beers because I feel like it was in a glass all by itself. However, in terms of how much I enjoyed it I can slot it in below. It's misleading though because I'd highly recommend this beer if you're looking to try something very different from your standard pumpkin ale. One thing I learned this year is that imperial pumpkin ales are far more enjoyable for me than regular pumpkin ales. For 2013 I think I will stick exclusively with the imperial variety. After dinner we split a single cupcake from Sugarrush which was voted the best cupcakes in New Jersey! 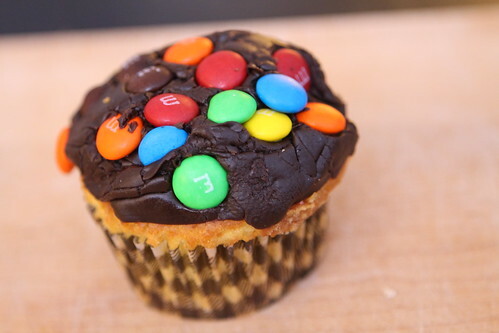 It was an extra bonus for me since Jen doesn't like M&Ms and I got to eat all of hers. Except for the ones she spit out, that would be a little gross. After dinner we enjoyed some quiet family time where I got to share a beer with Elliott. He seemed to really enjoy it. Note: Before any buttinsky parenting experts chime in, no babies were actually fed any beer in the making of this blog entry. Labels: babies, beer, Dessert, How'd we use it?, one pan, salad, What'd we get? I have always heard that babies LOVE beer. I apparently LOVED beer when I was a baby (and did drink some.) I guess you can decide whether or not you want your babies to turn out like me or not, and let them drink or not drink beer accordingly? I think cows like beer too. I think it's because it's just grains and animals like grains. I'm like an expert about stuff. And it looked like a decent bottle of beer as well. My Father gave me Miller High Life while we watched Howdy Doody, you can draw your own conclusions. Want to contribute as much as 0.02% toward our monthly grocery bill? Why not choose from one of these subscription plans which is probably about 1/90th of what you spend each month on coffee from DunkinBucks! Give us a small one-time donation. We'll be sure to thank you in the blog entry! We might even name a dish after you! This is a Flickr badge showing items in a set called Farm Share. Make your own badge here. Aye and Begorrah! Let's Have Some More-ah! Foods Inspired by the Movie "White Christmas"